We are so excited to be part of Arts in the Parks this year thanks to funding and support from Toronto Arts Foundation and their partners. 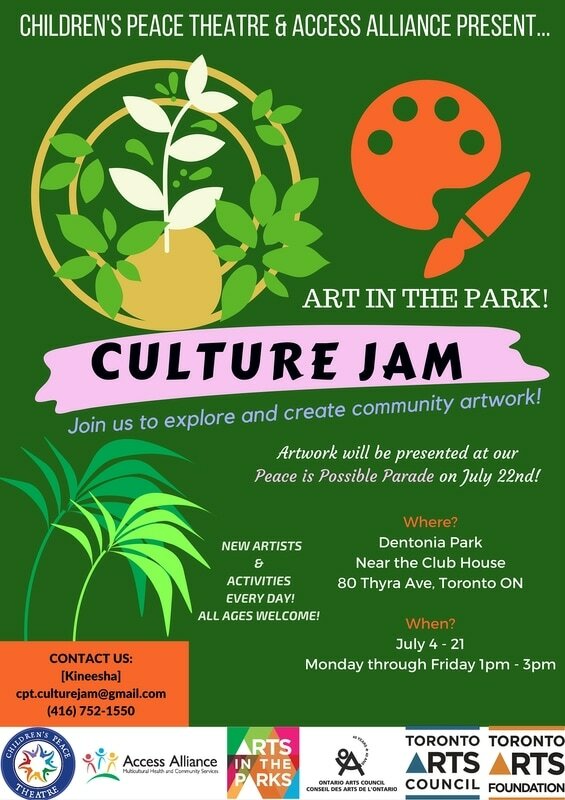 ​Peace Theatre and Access Alliance Multicultural Health Services are partnering again to bring their amazing Culture Jam Program and Peace is Possible Parade to two communities in Toronto Taylor Massey in the East and Rockcliffe- Smythe in the West. Youth group meets Monday to Friday 1-4 at Access Alliance for arts based activities and Conflict Transformation. Peace is Possible Parade July 22nd. Youth group meets Monday to Friday Jul 25 to August 5 1-4 at Access Alliance for arts based activities and Conflict Transformation. Peace is Possible Parade, August 5. Parade in late afternoon followed by BBQ in Woolner Park. Kudos to the summer student team Pamini, Bella and Merbib who developed curriculum and provided three weeks of arts based Conflict Transformation with children 7-12 and youth 13+ culminating in an exciting PIP Parade complete with Samba Band and dance performances for the Rockcliffe Smythe community. Meanwhile on our home base in the Taylor Massey Community, Dion, MacKenzie, Jessica and Natasha redesigned the Conflict Transformation curriculum highlighting the importance of Toronto, the Worlds most multicultural city, hosting the Pan Am Nations. 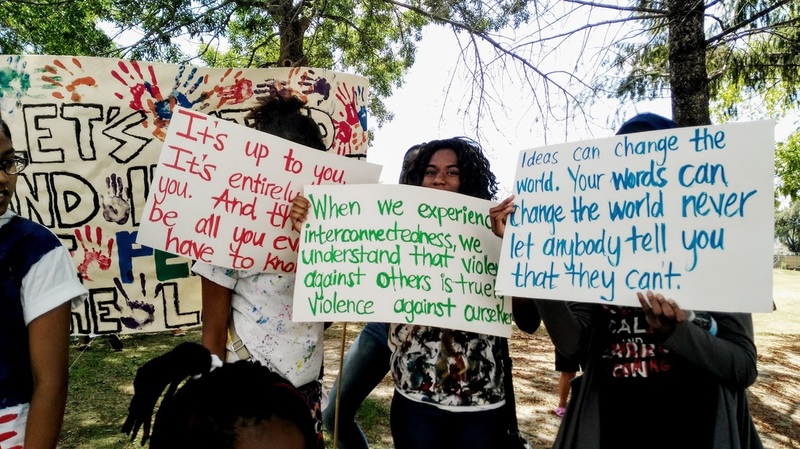 For three weeks they delivered free programming for over 75 children and 20 youth helping them to explore identity and culture and learn skills in Conflict Transformation. They also all did an amazing job with the 12th Annual Peace is Possible Parade bringing out over 150 people to the Danforth Village with their messages of celebrating diversity. Parents in both communities are reporting a rampant use of the Breath of Peace (BOP) and the Three C’s (Courage, Compassion and Creativity) at home!